PHOENIX INTERNATIONAL FOLK DANCERS holds weekly dances on TUESDAYS from 7 - 10 PM at the IRISH CULTURAL CENTER in PHOENIX. 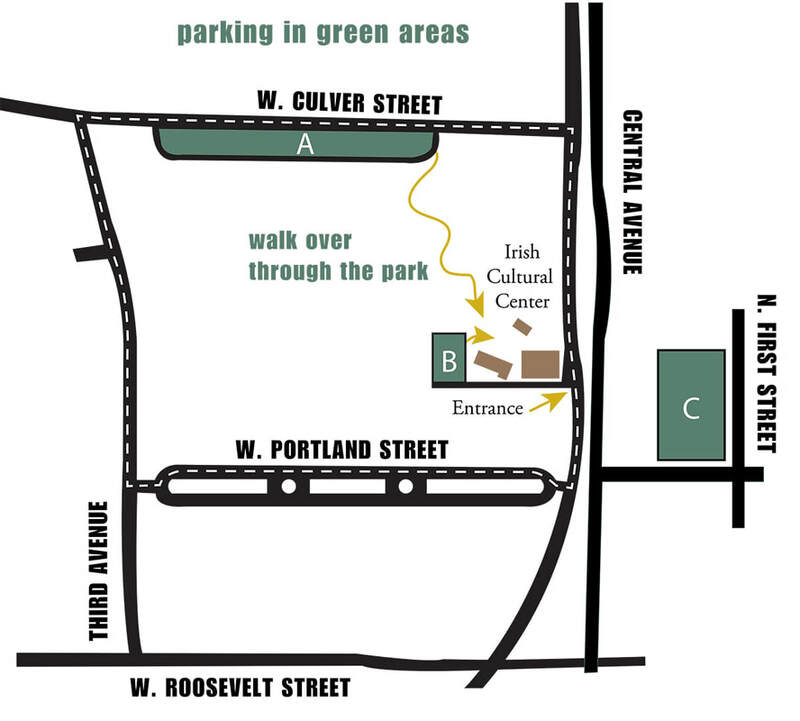 The Irish Cultural Center is at 1106 N. Central Avenue just south of Culver Street in Phoenix. Culver is between Roosevelt Street and McDowell Road. The Center is on the edge of the Deck Park that covers the I-10 tunnel. Take I-10 East towards Tucson. Exit at 7th Avenue. At the top of the exit ramp, turn left (north) on to 7th Avenue. Immediately after coming onto 7th Avenue take the first right turn, which is Culver. Continue on Culver until it ends at Central Avenue. Turn right onto Central, over the hump and turn at the first right turn lane into the Irish Cultural Center. Take I-10 and stay on it. Drive through the Deck Park tunnel. In the tunnel, which begins after the 7th Street exit, move to the right lane and take the first exit, 7th Avenue. It will be the first exit after you leave the tunnel. At the top of the exit ramp turn right (north) on to 7th Avenue. Immediately after turning onto 7th Avenue, take the first right which is Culver. Continue on Culver until it ends at Central Avenue. Turn right onto Central, over the hump and turn at the first right turn lane into the Irish Cultural Center. Get to Central Ave. by any major east or west street that is north of the I-10 Freeway, such as McDowell Rd. Go south on Central past Culver (which is across from the Burton Barr Library) over the hump, and turn at the first right turn lane into the Irish Cultural Center. St. Matthew is located on the north side of Baseline Road midway between Dobson Road and the 101 (Price) Freeway. (NW corner Baseline Road and El Dorado) Baseline Road is just south of US-60 Superstition Freeway. Fellowship Hall is the middle building with the entrance on the El Dorado side. TAKE I-10 E (toward Tucson) to US 60 E (Superstition Fwy) (toward Globe). Continue on US 60 E to McClintock Exit 175 in Tempe. Turn right on McClintock one-half mile to Baseline. Turn left on Baseline past Price Rd. and 101 Freeway. Continue on Baseline past signal at Don Carlos to next left turn break in center divider (at El Dorado.) Turn left on El Dorado. Church will be on your left; go around to the rear entrance to parking lot. Fellowship Hall is the central building; entrance is on El Dorado side. Take I-10 W to AZ-51 N. Take the Bethany Home Road exit (4B) left (west) and follow Bethany Home to 15th Avenue. Turn right (north) and go one half mile to Maryland. The church is on the NW corner of this intersection. Take I-17 S and exit at Glendale Avenue (exit 205). Go left (east) and follow Glendale Avenue to 15th Avenue. Turn right (south) and go one half mile to Maryland. The church is on the NW corner of this intersection.